The scarcity of affordable housing is one of the root causes of homelessness. The Joint Center for Housing Studies of Harvard University reports that 71% of extremely low-income renters spend over half of their income on housing, a huge cost burden that squeezes out money for other items in the household budget. Meanwhile, rent subsidies are only available to 24% of households who are eligible to receive them. Families cope with excessive housing costs by overcrowding, “doubling up,” and choosing between their basic necessities. For households on the brink of homelessness, almost any financial setback can be enough to result in the loss of housing. High rents and the lack of available subsidies are also the main hurdles in solving homelessness for many people who are currently in the emergency shelter system. Given these harsh realities, it is nearly impossible to envision a pathway to end homelessness without significant expansion of rental assistance. 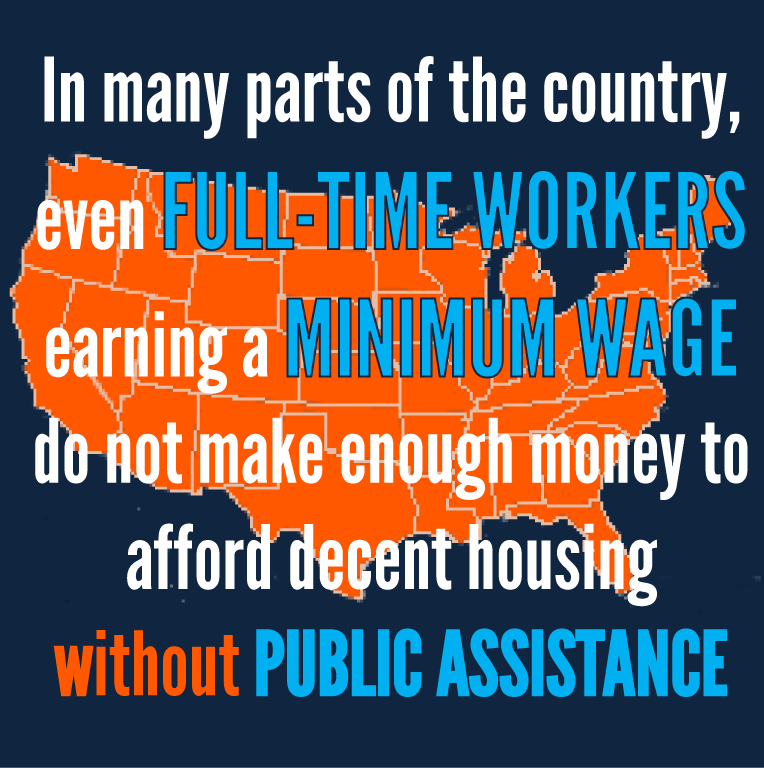 Based on research by Apt Associates, nearly 9 million low-income households are in critical need of help with their housing costs. Yet current programs assist less than a third of this total number. Rental assistance through Section 8 housing vouchers allows low-income households to go into the private market, look for apartments, and supplement their income in the amount that they can pay. At a time when the supply of public housing has been shrinking for years, vouchers for private apartments are the primary federal program that provides housing assistance to families and individuals at risk of homelessness. Yet less than one in four of those eligible for that assistance – legitimately, legally eligible – receive help because there are very few dollars in the program for new participants. With thousands of people on the waiting lists already, most cities in America aren’t even accepting additional names. Wait times for those lucky enough to be on the list can stretch for many years. Making matters worse, Congress cut 70,000 housing vouchers last year as part of the so-called sequester. The loss of these vouchers shrunk the Section 8 program and froze progress on waiting lists. If you’re one of the majority of low-income households paying most of your income on rent, there is virtually no help available to you unless Congress puts more money into the program. Advocates need to do two things: First, we need to tell Congress to put back every penny it cut from housing vouchers in 2013. 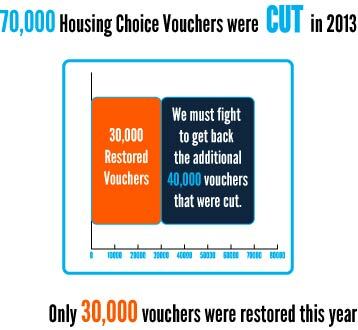 Cutting 70,000 vouchers in the middle of a housing crisis was irresponsible – we can’t allow that reduced number to become the new baseline for the program. This year’s budget needs to replace those lost vouchers and bring the program up to the same scale as it would have been without the so-called sequester. Second, we need to build a stronger grassroots network that is ready to demand action for the millions of people who need housing assistance and aren’t getting it. We need bold new thinking that goes beyond the current programs, like a renter’s tax credit and full funding of the National Housing Trust Fund. We need a lot more organizing. Most of all, we need to challenge the parameters of what Washington feels is possible right now – demanding resources that match the scale of the problem and that offer real solutions to homelessness in America. We need to let Congress know that we do not accept their decision to reduce housing voucher funding. The Department of Housing and Urban Development (HUD) cannot pull funds from other areas to sustain this program; funding must come from Congress. 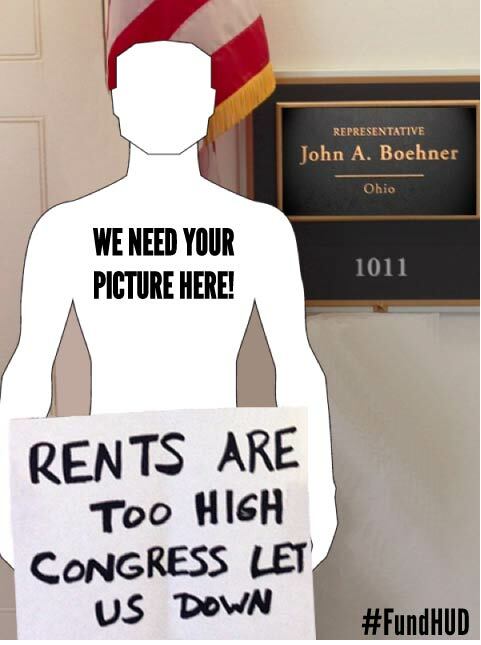 Get in touch with your Representative to discuss the importance of rental assistance. Inform your neighbors about what is happening. Write an editorial to encourage others to become involved. Any action is better than inaction. Share your photos, articles, and experiences online with the hashtag #FundHUD on Instagram and Twitter! See also Take a Number: The Long Wait for Rental Assistance - NCH's 2015 report on the availability of housing vouchers.